The nation’s longest-serving House speaker, Illinois’ Michael Madigan, has been a player in state politics for the better part of his 76 years. But it wasn’t until last September (Sept. 13, 2018, to be exact) that he gave his first-ever deposition. Madigan answered questions for nearly five hours from attorney Anthony Peraica, who is representing Jason Gonzales in a federal lawsuit. Gonzales accuses Madigan of recruiting a pair of “sham” candidates to split the Hispanic vote, to Gonzales’ detriment, in the 2016 House 22nd District primary race. Madigan ultimately won that contest; he went on to win his 24th two-year state representative term this past November. While the lawsuit has yet to fully play out, the newly released deposition contains nuggets of little-known or buried information about the famously guarded speaker. “I won’t tell her,” Peraica said. While he’s known as a classic Chicago South Side Irish politician and went to Catholic school (he graduated from St. Adrian elementary school, St. Ignatius College Prep in 1960, Notre Dame in June ‘64 and Loyola Law School in June ’67), Madigan does not go to church. Madigan said “once upon a time” he regularly attended services as St. Adrian and that “for a time” he “would be a regular attendee at St. Nicholas of Tolentine” but he does belong to a church or parish. Madigan’s government career started as soon as he graduated from law school. He worked for the Illinois Commerce Commission as a hearing examiner in 1967, and as an assistant corporation counsel for the City of Chicago Law Department in 1969 he analyzed police reports for the liquor commissioner. Madigan then served as a delegate to the state constitutional convention, and shortly thereafter – in 1970 – won his first race for state representative. He has a younger sister: 71-year-old Marita. Madigan is a notary. Getting something notarized is a free service provided at two 13th Ward constituent offices Madigan shares with 13th Ward Ald. Marty Quinn (other services include help with rodent control, sanitation issues, tree trimmings and block party permits). Madigan’s ward organization also pays for 13th Ward precinct captains to become notary publics (precinct captains also get their own business cards). Document: Read the transcript Did Madigan do it when he was facing off during the 2016 primary against Gonzales, Joe Barboza and Grasiela Rodgriguez? “My view of the responsibility of the Ward Committeemen is to work on behalf of Democratic candidates in the general election; to distribute their literature; to prepare a sample ballot, and to distribute the sample ballot. In the primary election, why everybody is a Democratic or claim to be a Democratic and you pick someone that you would support in the Primary Election,” Madigan said of the position, according to an official transcript. Peraica asked Madigan whether this is a full or part-time responsibility. “So it could go 40 hours a week or more?” Peraica asked. Peraica spent some time on Madigan’s duties. What about life beyond politics? In 2014, Madigan proposed a surcharge on income over $1 million to go toward education. He admitted that, should the surcharge take effect – it never passed – he’d have to pay it some years. Perhaps that’s why Madigan was embarrassed to admit he doesn’t know his take-home pay for his state job. “What is your salary as Member of the House?” Peraica asked. “You’re going to embarrass me again, because I don’t know the exact amount. I don’t know exactly what it is,” Madigan said. “So you don’t rely on it, huh?” Peraica said. (State legislators make a base salary of $67,836, not counting per diems and a stipend for leadership roles. According to the Legislative Research Unit’s latest online report, legislative leaders – such as the Speaker – can collect up to $27,477 more). Despite having to juggle so many roles, Madigan does not have or use e-mail (“Do you have email yet or no?” Peracia asked at the tail end of the deposition. Madigan’s reply was to the point: “No.”). Madigan also said he keeps his own calendar though it’s maintained on a computer by a secretary. “Do you have someone who keeps your schedule?” Peraica asked. “I do that,” Madigan said. “I do the schedule. It’s maintained in a computer by my secretary in Springfield,” Madigan said. Just who is a part of Madigan’s inner-circle? The deposition makes clear he puts a lot of trust in office-mate Quinn. Madigan said he did not have a campaign manager during the 2016 election cycle, but Quinn in effect played that role. Madigan said he did not personally review his own petitions that were necessary for him to get on the ballot “because they would have been reviewed by someone else”: Marty Quinn. Madigan said “to a certain extent” he delegated who would be hired and involved in his re-election campaign that March. Other key people coordinated with Madigan. During the 2016 election cycle, Madigan spent a couple of hours each Sunday on a conference call to talk strategy. Among those who took part in the weekly conversations: Quinn, former right-hand man Tim Mapes (who was forced to resign following harassment allegations), Will Cousinea (a lobbyist who had been a top aide on the government side) and Steve Brown, Madigan’s privately contracted spokesman. Madigan appears to view other longtime Democratic elected officials more as fair-weather friends. “Did you consider Ed Burke an ally, still do?” Peraica asked. “Sometimes yes, sometimes no,” Madigan responded. During the time of the deposition, then-Gov. Bruce Rauner was struggling in polls behind current Gov. J.B. Pritzker. Madigan didn’t let up on his nemesis, though. Anyone seeking Madigan’s help getting a job needs to pass a test. “You can understand that many people come to me asking for recommendations for employment, and I render recommendations for employment in both the private and the public sector, I do it in both. But there’s a test that people have to meet. They have to be, to my knowledge, they have to be honest hard-working people with integrity. 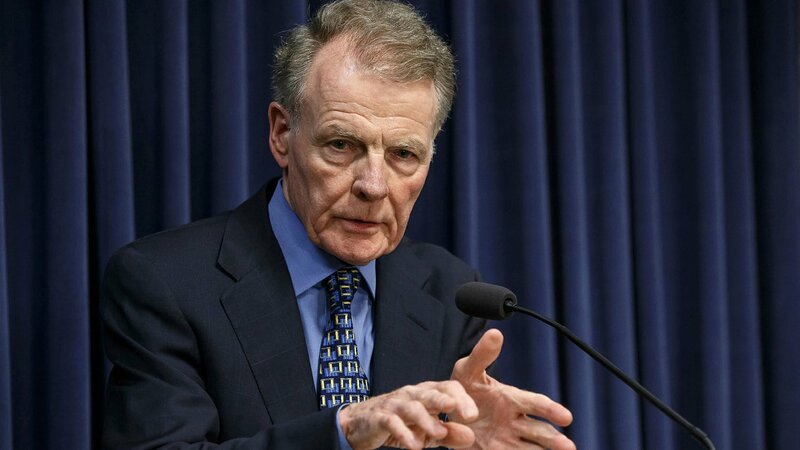 And if they are, I’ll recommend to a potential employer the best of my knowledge and my experience with this person, this would be a good worker for your office, a good worker for your business whatever it may be,” Madigan said. Peraica followed up to ask whether it’s a function Madigan enjoys. “Is that the least favorite part of your job?” Percaica followed up. “That’s a tough question. Give me some time to …” Madigan said. His attorney Mike Kasper then interrupted, to protest asking Madigan for an opinion. “You haven’t spent much time in Springfield so that would be a whole new world for you,” Madigan said in response. Peraica spent a chunk of time asking Madigan about various individuals the powerful Democrat has apparently put in a good word for. Among names mentioned: Edward Tully (“My memory is that I recommended him for his current job … somewhere in Cook County”), Thomas Siska (who Madigan said is now retired from the secretary of state’s office; “My memory is that I would have recommended him for that job”), Erin Foley (a 13th Ward Organization member who Madigan said he “may have” recommended for a state post), Daniel Huicochea (“I think he’s no longer with us,” Madigan said, in reference to Huichochea’s membership in the 13th Ward Organization), Karen Cicero, Hugo C. Chavez, Isidro Rosado, George Barrera (“I recommended him” to the Chicago House Authority), David Foley (“I recommended him to the Secretary of State”), Susan Moran (“either I did or a would recommend her”), Collin Gruca, Kyle Gruca and Fredy Moody. Peraica also asked about several individuals who he said his records showed were paid by one of Madigan’s political committees, but Madigan said he did not know them (“If he were to walk in the room, I wouldn’t recognize the guy,” he said of one, and, “Yeah, I don’t know him,” he said of another). Again, Madigan was direct with his response. His memory is spot-on. Until it isn’t. Madigan was sure of himself in instances. He often knew whether someone he’d recommended for a job still held it or if they had moved on. He recalled the percent of his district that was Hispanic (60 percent) in 2010, when the last legislative map was drawn. He uttered that phrase, or something similar in meaning, at least 120 times. When did Madigan learn that other candidates would be filing to run in the 2016 Democratic primary? When did the weekly telephone conference calls begin? When was the last time he notarized a document for someone else? Did Madigan’s main campaign account, Friends of Michael J. Madigan Committee, “financially support candidates” during the 2015-2016 election cycle, beyond his own re-election campaign? Did Madigan and his advisors discuss the three Hispanic candidates running in the March 2016 primary? “Is there anything that would refresh your memory?” Peraica asked during that conversation. “Just spending more time with you,” Madigan responded.